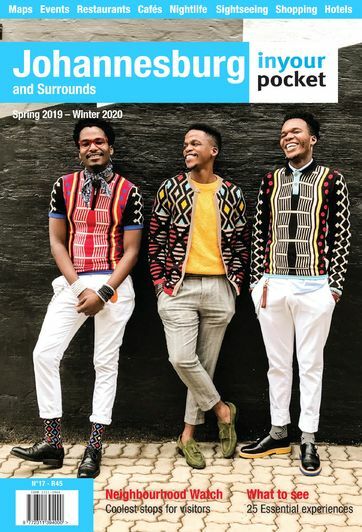 Kennedy Tembo is the Ambassador of adventure in Joburg. 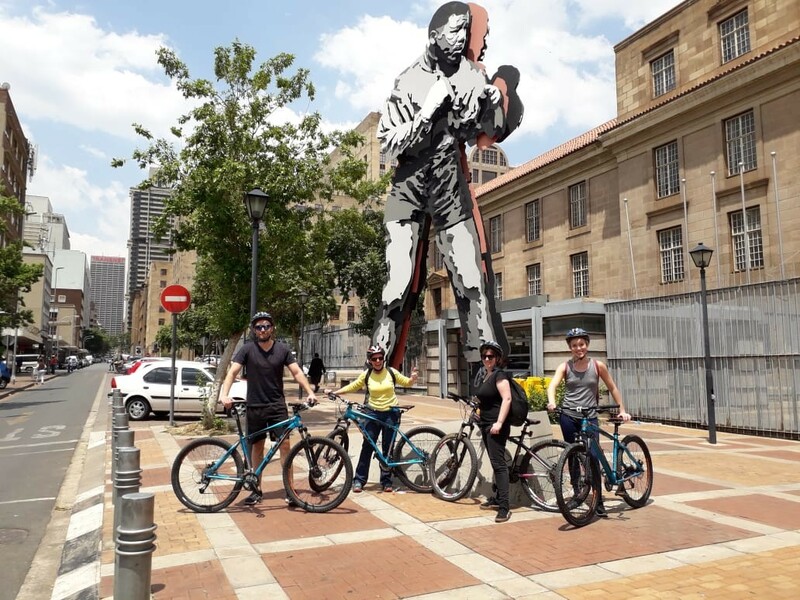 He founded Microadventure Tours in 2017 to connect Joburgers with experiences outside of their comfort zone that are right in their backyard. A fitness fanatic himself (he has run Comrades and Ironman and pioneered the race to the top of Africa's tallest residential building, The Ponte Challenge), Kennedy's tours include cycle rides through Joburg and around the scenic Cradle of Humankind as well as trips to tackle adventurous hiking routes in the Drakenesberg mountains. 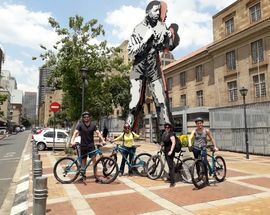 One of Microadventure's newest tours is the Jozi Coffee Cycle Tour, a coffee-themed bike ride through downtown Joburg. 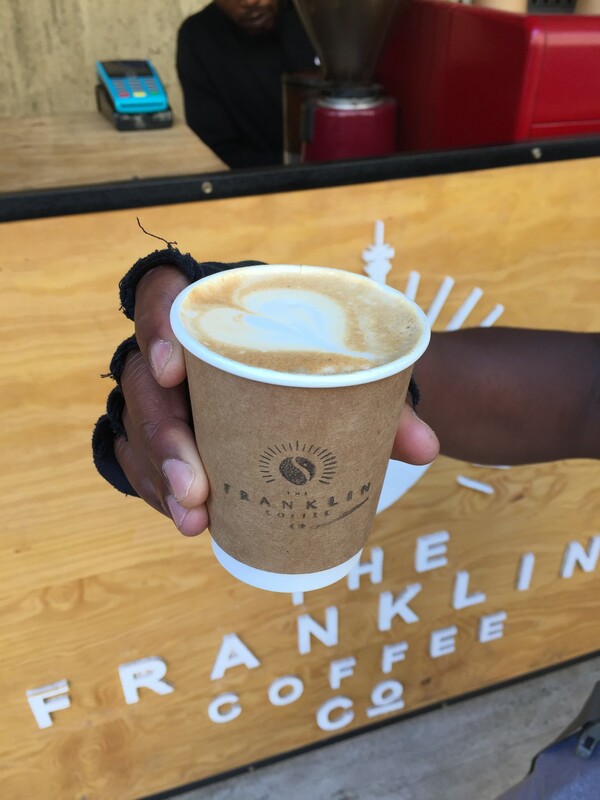 The tour starts at 09:00 at Origin Coffee Roasting in Maboneng with the first cuppa of the day (pace yourself – there are four more coffee stops to come!) and then it's time to gear up in your bike helmets and prepare to ride. 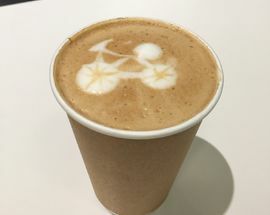 While the Jozi Coffee Cycle covers about 10 kilometres, you move at a leisurely pace over flat streets with numerous photo stops and coffee breaks along the way. 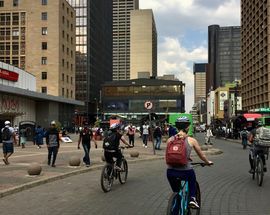 Those who might feel wary about cycling through Joburg's crowded downtown streets will be pleasantly surprised to find that even without bike lanes, cycling in the Joburg City Centre is a breeze. 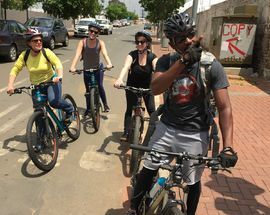 Drivers are patient, the speed at which vehicles move barely gets over 40km per hour and most drivers and pedestrians are more curious about the spectacle of a group of cyclists taking a tour of a city than bothered by having to share the road. Microadventure's good quality mountain bikes are also a bonus. 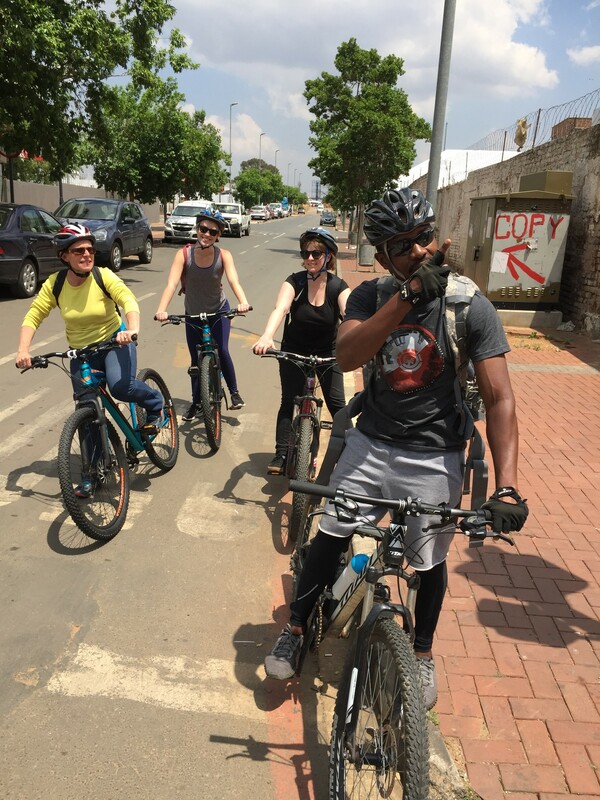 From Maboneng the tour takes off down Main Street, past the ABSA precinct and Carlton Centre and through Gandhi Square to the first coffee stop in historic Marshalltown in front of the Rand Club. 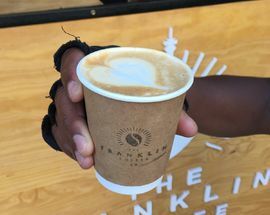 The Franklin Coffee Co is an unassuming coffee stand on wheels that is helmed by a charismatic barista who brews up a brilliant macchiato for the morning commute. 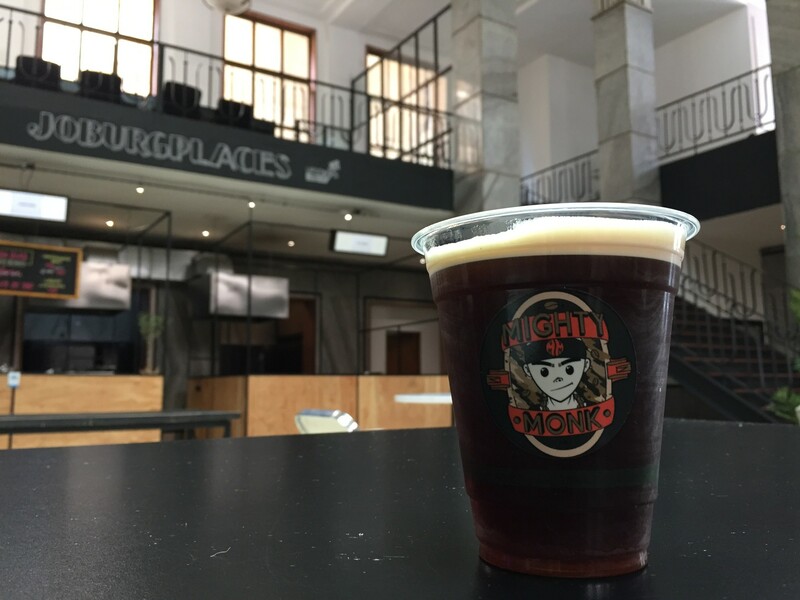 From there, it's a short hop to the Modernist masterpiece that is the cavernous City Central Food Hall (formerly home to Barclays bank), where, if you have room for even more caffeine, you can sample Mighty Monk's signature cold brew coffee before visiting Corner House at the end of the block, where yet another coffee shop, Ornate Coffee, awaits. 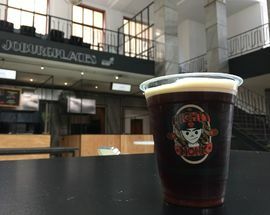 Built in 1903 for the Anglo mining company, when it was completed Corner House was the tallest commercial building in South Africa and its splendid interiors, resplendent with stained glass cupolas, wrought-iron staircases and majolica tiles, have been carefully preserved. 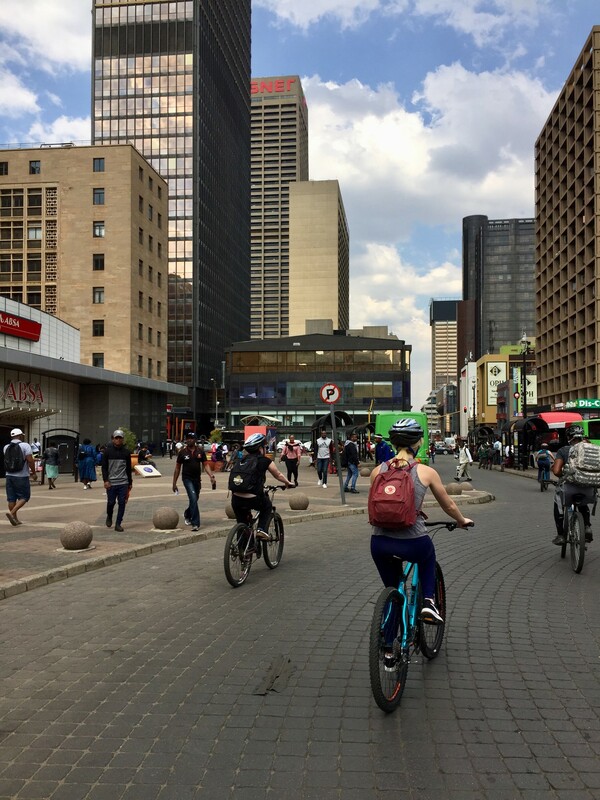 Here the adventure deviates from a cycle and coffee tour, to a detour into one of Joburg's lesser known architectural marvels. After sumitting the emerald-tiled staircase there's the opportunity to admire a birds eye view of the city before descending into the abandoned vaults and perfectly persevered mid-century atrium of the grand National Bank Building. Hopping back on the bike for the final stretch of the tour, you make your way down a leafy and quiet stretch of Fox Street towards Newtown, past the grand stone facades of the Anglo American building, making a pit stop for photos in front of Marco Cianfanelli's statue of a young Nelson Mandela shadow boxing and onwards to the graffiti-painted underpass beneath the M1 highway. Riding beneath the highway with its numerous busy intersections and faster moving traffic is both exhilarating and slightly daunting, however Kennedy is more than attentive, leading the group cautiously and confidently onwards to the final coffee stop. Just beyond Mary Fitzgerald Square, the tour takes a turn onto the graffiti filled Gwigwi Mrwebi Street for a stop at the Craft Coffee roastery and a chance to stretch your legs and take photos of the graffiti murals. 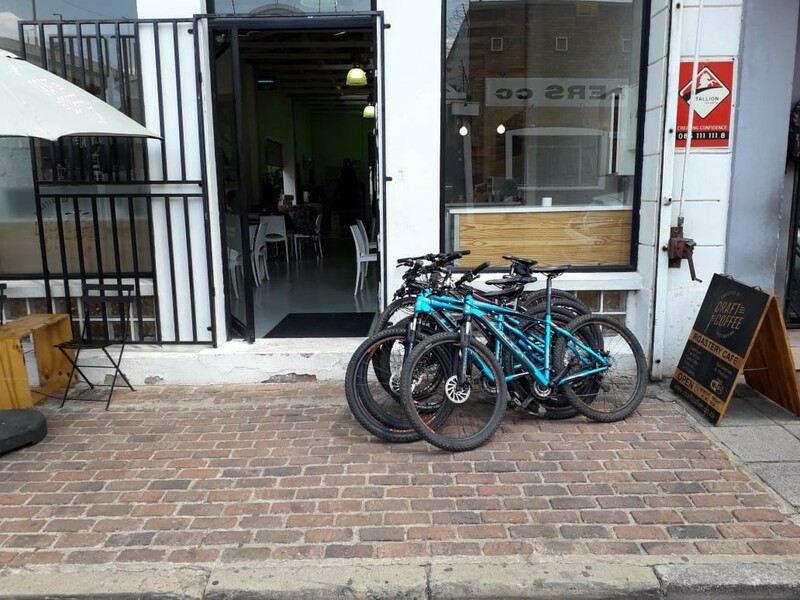 Suitably watered and caffeinated, it's time to retrace your pedals and return to Maboneng via the Main Street Mining District. 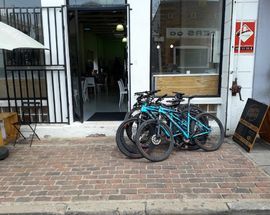 The tour then makes one final stop for a light lunch at the City Perk Cafe in the heart of the historic mining district before cruising back down the road to Maboneng where you disembark, slightly wobbly, from a thrilling day of exploring Joburg by bike and indulging in the city's best coffee. 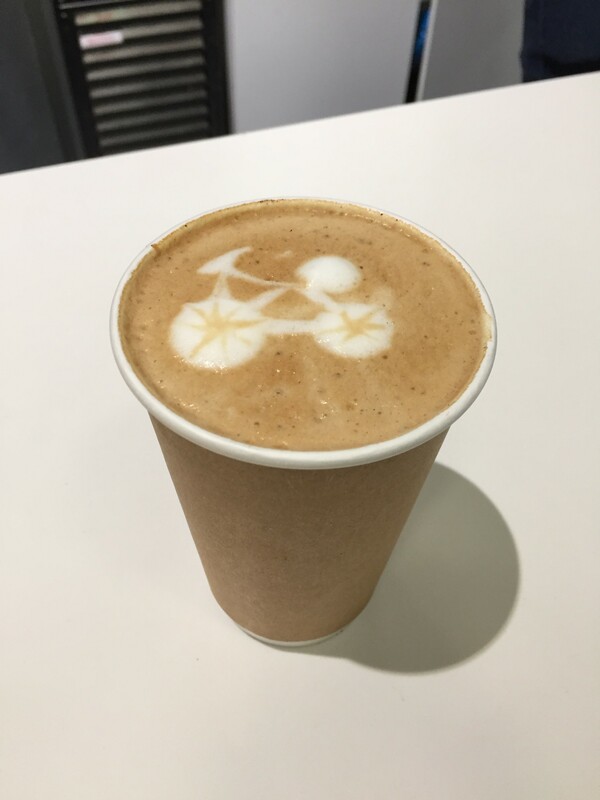 The Jozi Coffee Cycle Tour lasts approximately five hours. Bikes and helmets are provided. To book call Microadventure Tours on +27 83 772 4678 or email info@microadventuretours.co.za. Tours cost from R350 per person.